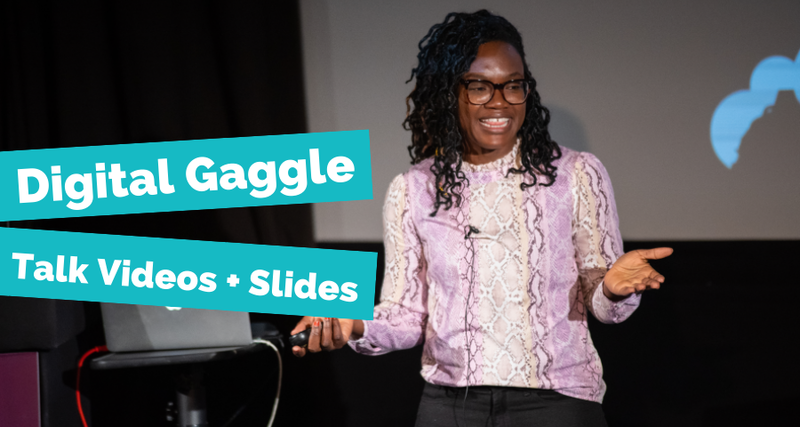 Victoria Olsina - mobile phone addict, comedian and SEO wizard - came and rocked our page speed worlds at the Digital Gaggle conference the other week. 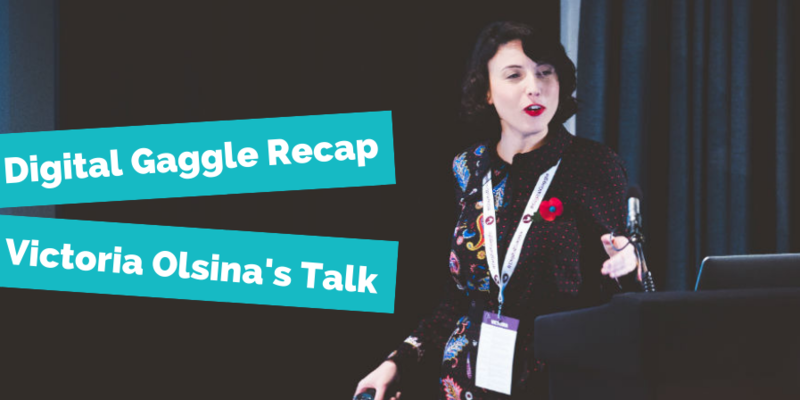 Promising to help us address page speed politics with her talk 'How To Build A Business Case To Actually Get Sh*t Done”, Victoria’s talk was full of actionable takeaways and hilarious on-the-nose political commentary. *For SEO people only, since nobody else seems to care, as Victoria notes. Page speed as a metric has come a long way since 2010, when Google first confirmed it to be a ranking factor for desktop searches. With mobile-first indexing growing, page speed on mobile has also become an unsurprising ranking factor too. So 2018 has very much been the year for page speed, with more and more people talking about it and even Google updating its PageSpeed Insights tool. 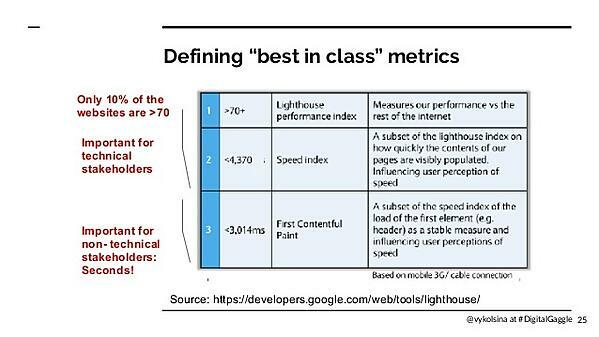 This means it’s more important than ever to measure, monitor and improve your site’s page speed. And Victoria was able to outline the major hurdles you will come across when trying to bulk test your page speed. How much is that metric (indexes) in seconds? What's the commercial benefit of that project? What do we need to make it happen? So you’ve got sign off, what next? Think about which pages you plan to monitor. Your high conversion pages and landing pages should be your priority, obviously. Improving the performance and UX of these key pages should produce perceptible results for your team and senior decision makers. 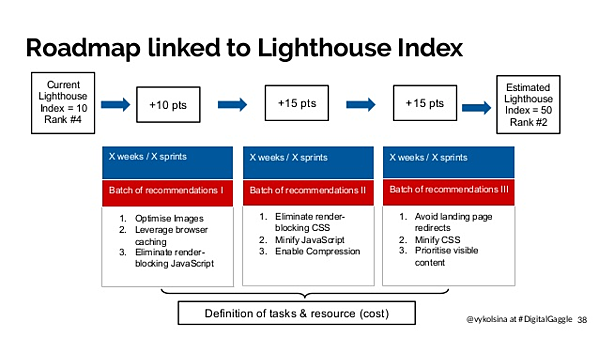 Of course, you can consolidate the first of these two as Google PageSpeed Insights (PSI) now uses Lighthouse as its analysis engine. In fact, you can also take your FCP score from PSI now too. Using these scores, you need to define a “best in class” for your sector and your vertical. Draw up a competitive landscape, dated, so you can prove your ROI. 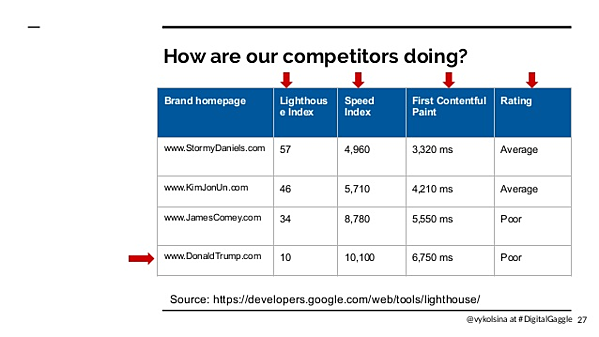 Victoria also mentioned Google’s Test My Site as another useful page speed tool for this competitor audit stage. 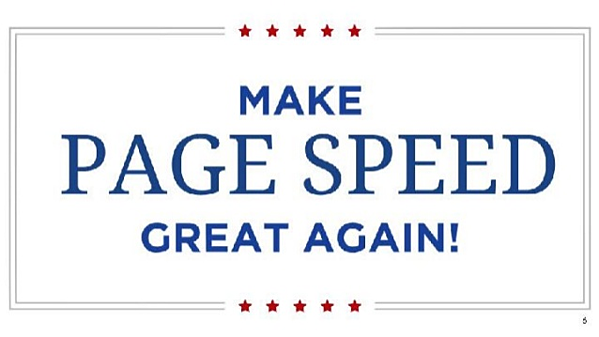 Now that you’ve located where you currently sit page speed wise, it’s time to speak to your web developers. Ask them to help you define the resource and materials that you’ll need, as well as write a roadmap with timelines and milestones mapped out! List all of the optimisations you could make but be sure to avoid generalising your actions. 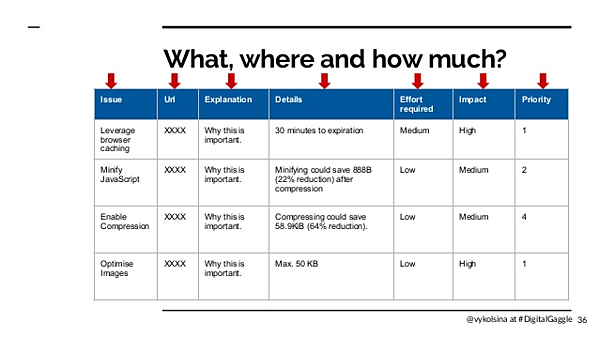 “Optimise images” is pointless if you don’t explicitly state which images are high priority and what optimisation looks like for those specific images - e.g. “serve scaled images at 250 px by 300 px on XYZ campaign pages”. Make sure your team know why each action matters, what difference it’ll make, which metric it relates to, when it needs to be done by, and so on. And of course, PRIORITISE. 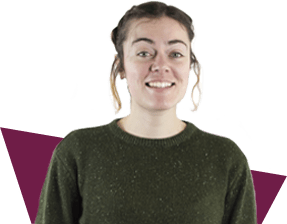 Compressing your “Meet the Team” images should come after you’ve enabled browser caching on your conversion pages, for example. Finally, Victoria covered governance and reporting. Who in your team is accountable for this project? Does everyone in the team know the key project deadlines, milestones and deliverables? Have you decided on an appropriate interval to update your competitor landscape document, based on the time you expect each optimisation action to be implemented? 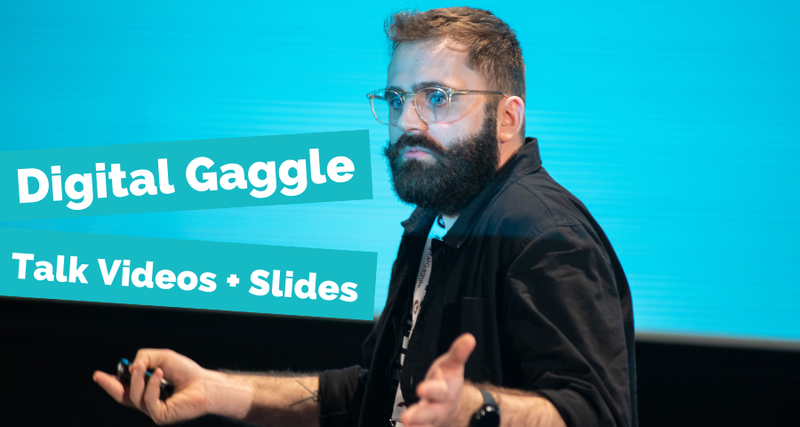 And of course, have you set up guidelines (based on all of the improvements you’ve made) for each and every new page that is added to your site? If a new page doesn’t meet these standards, it cannot be signed off. Of course, page speed is never finished, but with Victoria’s wisdom, beginning to build a business case to “get sh*t done” should be easy. 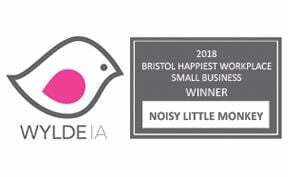 Junior SEO Executive at Noisy Little Monkey, Angharad is a fan of words and numbers. Basically, Countdown incarnate.